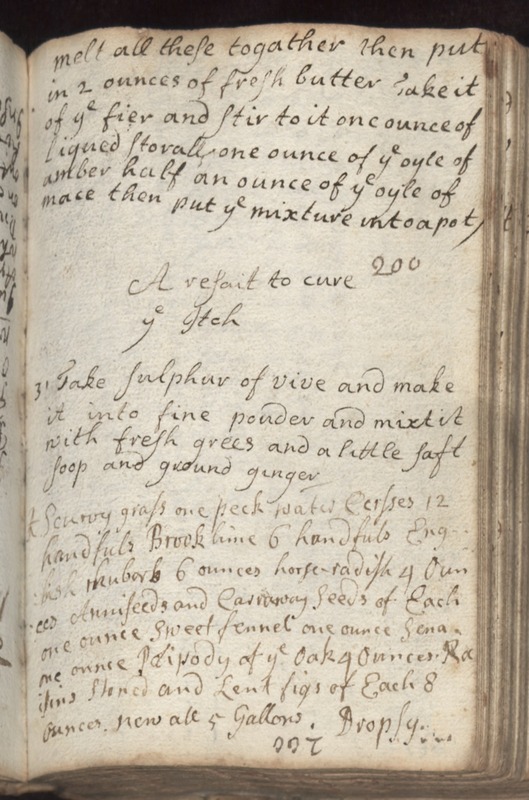 melt all these togather then put in 2 ounces of fresh butter Take it of ye fier and stir to it one ounce of liqued storall one ounce of ye oyle of amber half an ounce of ye oyle of mace then put ye mixture into a pot 200 A resait to cure ye Itch 31 Take sulphur of vive and make it into fine powder and mixt it with fresh grees and a little saft soop and ground ginger. [1/2?] Scurvy grass one peck water [Cersses?] 12 handfuls Brooklime 6 handfuls English rhubarb 6 ounces horse-radish 4 ounces Anniseeds and Carraway Seeds of Each one ounce Sweet fennel one ounce Sena one ounce [Polipody?] of ye Oak 4 Ounces Raisins Stoned and Lent figs of Each 8 ounces new ale 5 Gallons. Dropsy.